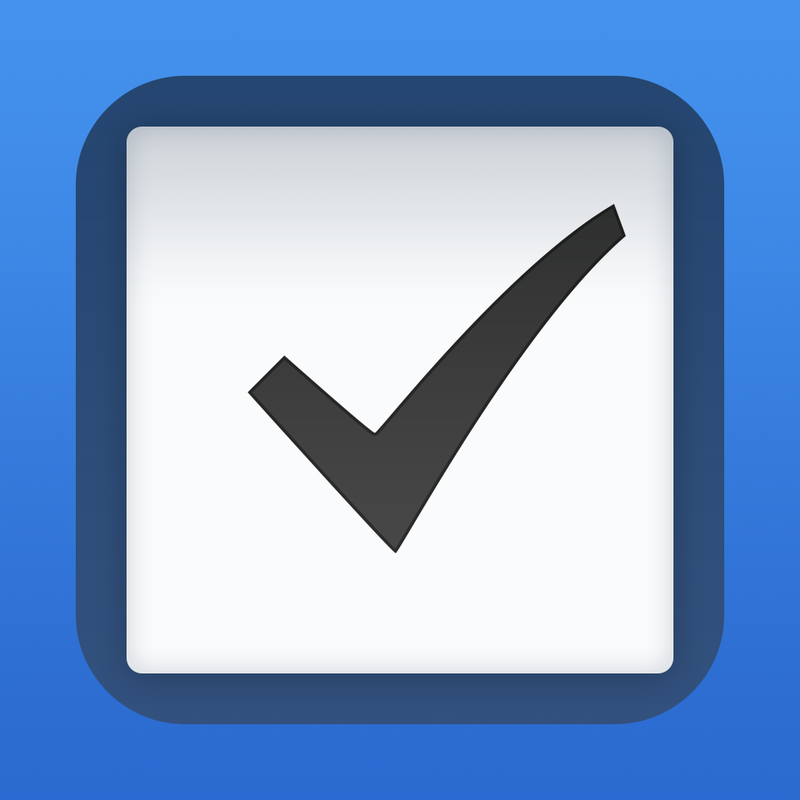 One List - Prioritized To-Do List & Task Manager (Free) by Gabe Rozenberg is a new and simpler way to deal with your tasks on a daily basis. 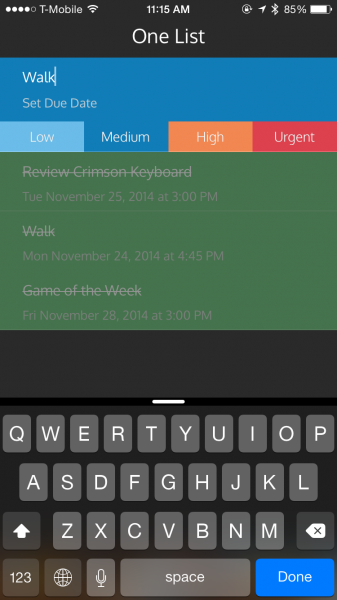 If other apps like Things and OmniFocus are just too much for you, then One List is a great option to consider. I consider myself a kind of productivity nut. I like to keep busy and get things done, and in order to do this, I rely on task managers and GTD systems. 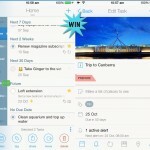 For a long time, I’ve been a fan of OmniFocus, but lately I’ve been giving Todoist a fair shot. Despite my consideration of moving my main system over, that doesn’t stop me from trying out other to-do list apps out there. Personally, I like to organize all of my tasks in separate views, but for some, this is just too much. That’s why there are apps like One List. 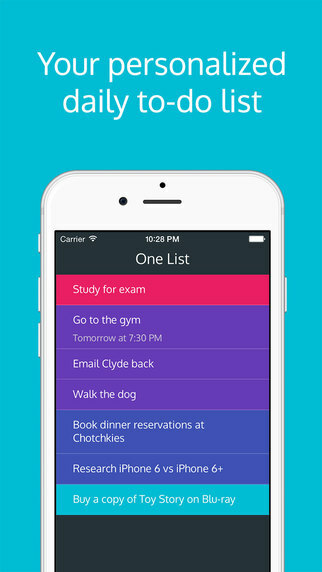 The interface for One List is as simple as they come. You can tell by the name, there is only one list here, so there’s only one view. It is also a bit reminiscent of Clear in a way, due to the intuitive gestures used for navigation and taking action with tasks. The colors used in the color schemes (four total) all fit nicely with each other, with vibrant colors used to represent each priority level. Animations are smooth when moving around, and the sound effects are fun. 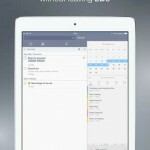 This is the perfect app for those who like to see everything in a single view, without the need to switch between projects, lists, contexts, perspectives, and the inbox. 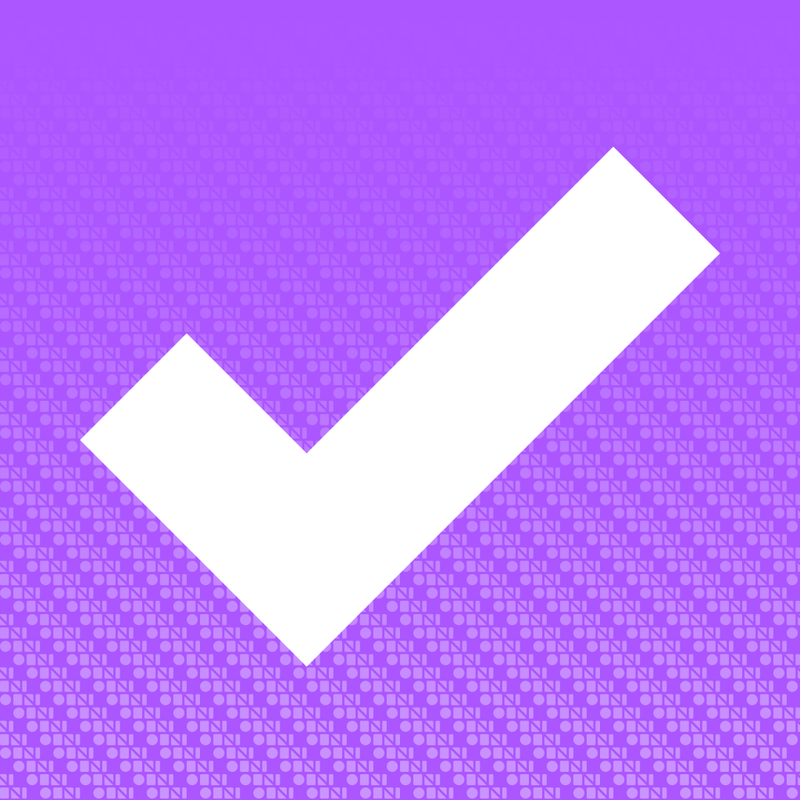 One List is, as stated in the name, one list for all of your tasks and to-dos to go in. To create a new task, just pull the screen down. From here, just type the name of the task, set the priority level (low, medium, high, or urgent), and add an optional due date and time. The due date picker is a nice pop-up window that gives users the option to pick a date infinitely in the future, and set a time right down to the minute. To save the task, just tap on “Done,” or pull the screen down to go straight to adding another one while the previous one gets saved and sorted in the list. As you begin to accumulate tasks in your list, you’ll never have to worry about being disorganized, as One List organizes all of your items in order of priority. 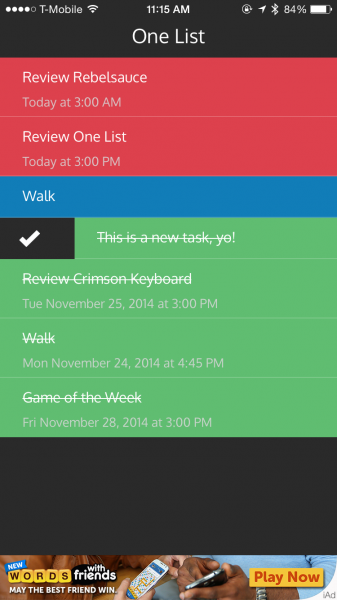 So your to-dos go in descending order from top-to-bottom, with the most urgent tasks at the top. 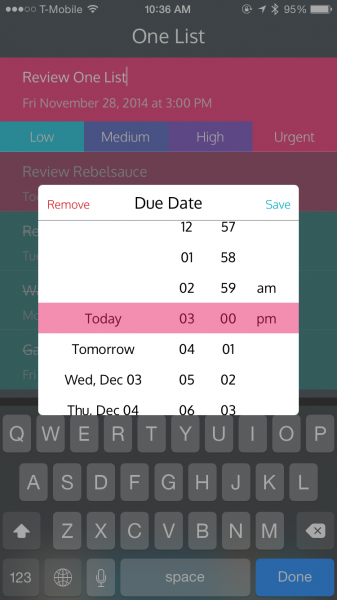 You can even see the due date and times you’ve set for items at-a-glance. Tapping an item will let you edit details, swiping to the left will delete, and a swipe to the right marks it as complete. 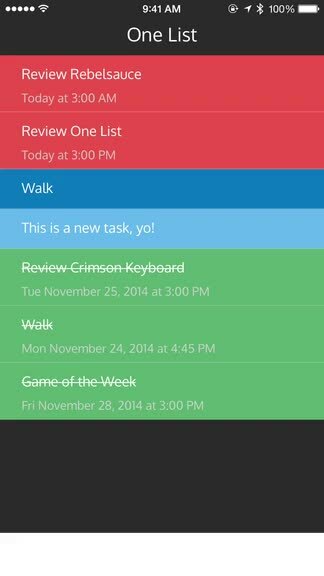 Finished tasks show up at the bottom of the list crossed off and in green. It’s all super easy to understand and use from the get-go, which is a must for a productivity app to appeal to the masses. 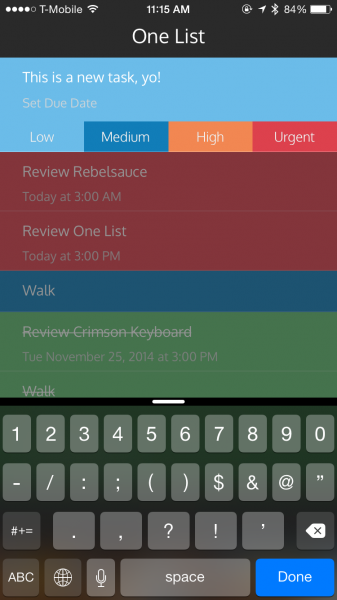 There is also a widget available for One List, which will display your Top Three Tasks for the day. 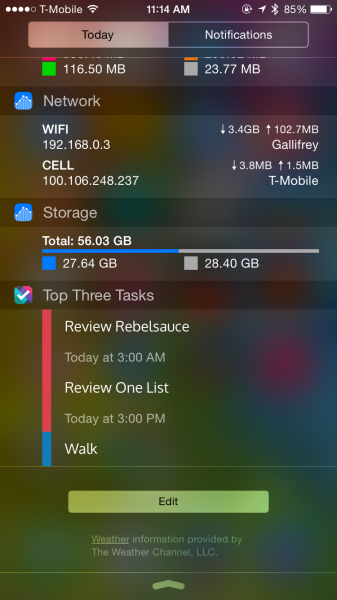 Unfortunately, there is no way to mark an item as complete from the widget, so it’s more of an informative view to keep you on task. I hope the developer can add the ability to quickly mark things off from the widget in the future. 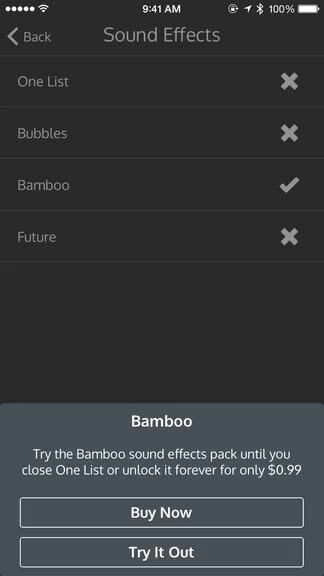 To access the settings in One List, just tap on the header bar. 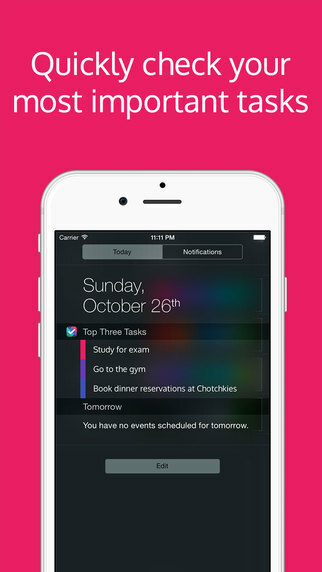 Settings includes due date notifications, daily reminders, and a daily quote to help motivate you. 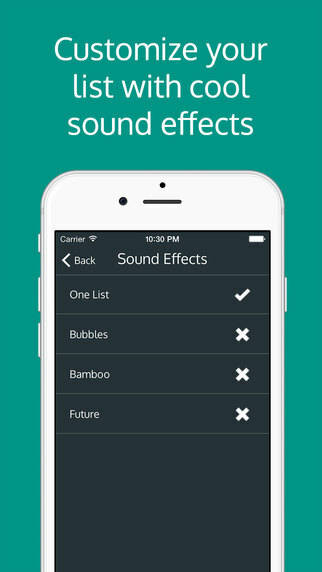 There are four different sound effects that you can unlock via in-app purchase or sharing the app on Facebook or Twitter. If you aren’t a fan of sounds, there doesn’t seem to be a way to turn them off other than having your entire phone on vibrate. Hopefully the developer fixes that in the future. 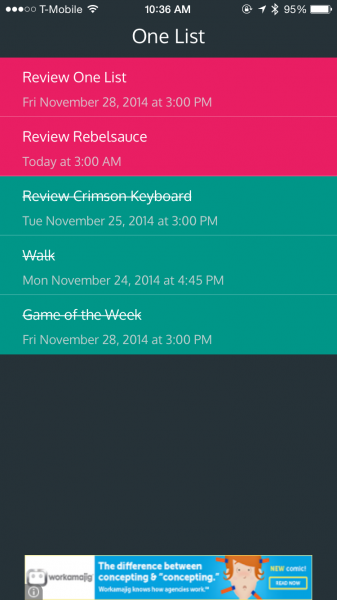 One List also has four color themes that you can use, all of which are available with the initial download. One List is a free download, but it is supported with an ad banner at the bottom every now and then. I’m sure that purchasing an IAP will remove it, though, but for the most part, the ad is unobtrusive and shouldn’t bother most people. Even though One List may not fit my workflow, I’m liking the simplicity of it, and it’s great to see everything at-a-glance from the main screen. It feels natural to use thanks to the gestures, the colors used for priority level are beautiful, and the sound effects make it fun to use. 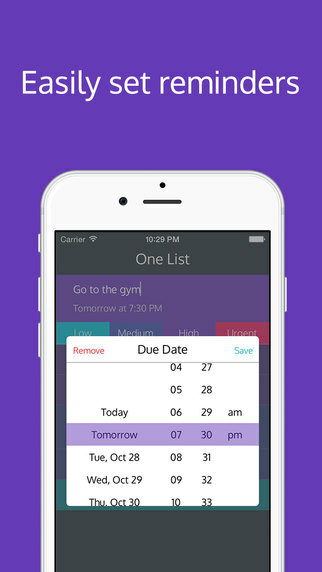 This isn’t an app that I’ll be using myself for the long term, as I prefer to organize my tasks by project and need to include notes, but I can see One List being useful for the average iOS user who wants something more than Reminders. 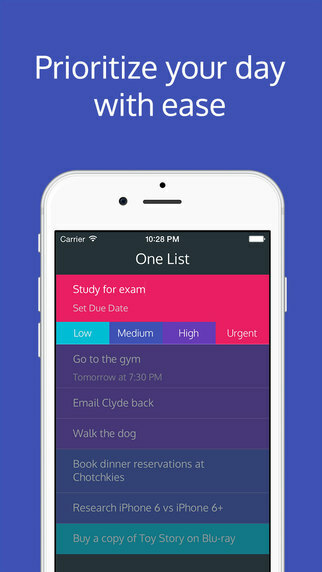 One List is available on the iPhone App Store as a free download with in-app purchases. 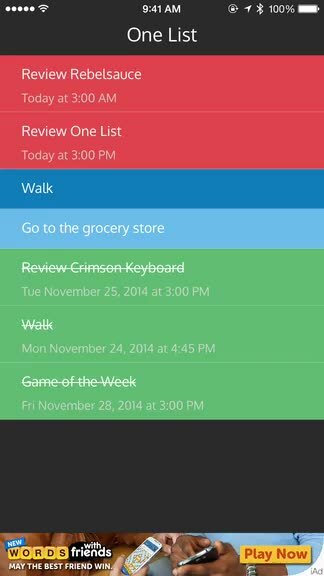 I’d recommend it if you need a straightforward way to manage your daily tasks, and it’s free, so it doesn’t hurt to give it a try for yourself.